The Women Food and God Retreat is designed for you to have space and time away from your day-to-day life, grounding yourself in the practices and principles you will learn. Our agenda is a full day of activities from early morning through the evening, and includes many group sessions and guided meals with Geneen, centering meditation, gentle body-sensing movement, and afternoon practice groups. You will also have personal time to enjoy our beautiful countryside setting. A typical day at the retreat starts with morning meditation/gentle movement. Each morning Geneen will join you at breakfast for her amazing guided eating meditations; these guided meals happen ONLY at the retreats. 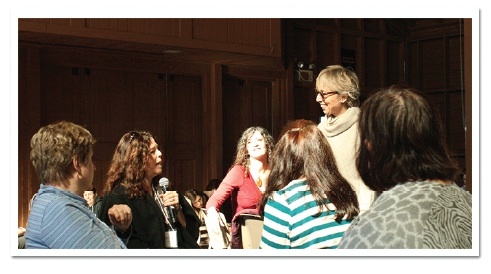 After breakfast, often Geneen facilitates a group session, with opportunities for interaction with Geneen and other students. After lunch, you will be in a group practice sessions facilitated by our retreat co-teachers for personalized attention and time to use the tools that Geneen teaches. And finally after dinner, you'll join Geneen and the group for an interactive evening session before bed. The retreat starts on Tuesday, May 14, 2019. Check-in is held between 2-5 pm, followed by dinner and the first evening session with Geneen. 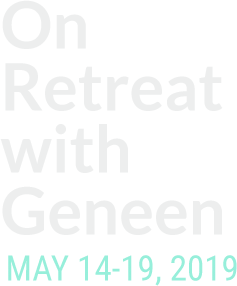 The retreat ends on Sunday, May 19th following a morning session with Geneen and lunch at 12:30 pm.